Eat to the beat of oom-pah band music in a romantic cobblestone plaza reminiscent of a 16th-century German town! 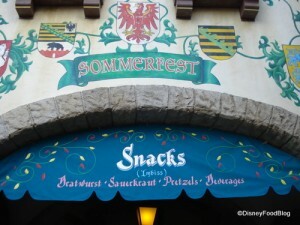 Sommerfest’s menu features traditional southern German quick service items: bratwurst, frankfurters, German desserts, a variety of German beers and wines, as well as sauerkraut. There are a few cafe tables outside of the restaurant’s service window near the Pavilion’s centerpiece — a statue of St. George slaying a dragon. Outside tables allow guests to enjoy their brats and beer in an al fresco environment. If the weather isn’t cooperative there are also tables and chairs under the cover of the German castle’s walls. Traditional Oktoberfest items: bratwurst on a roll with sauerkraut, frankfurters, salted pretzels, Black Forest cake, apple strudel, German beers and wine. Stick around to catch the Clock Tower; just like the real Glockenspiel in Munich, this beautiful clock has a surprise display every time the chimes sound on the hour. Watch out for Snow White, and occasionally her Prince, who make appearances right outside of the Germany pavilion.